0506.2.1 Prime - Identify prime numbers up to 50. 0506.2.2 Use Prime Factorization - Use the prime factorization of two whole numbers to determine the greatest common factor and the least common multiple. 0506.2.3 Fractions and Decimals - Use visual models, benchmarks, and equivalent forms to add and subtract commonly used fractions and decimals. 0506.2.4 Factoring - Use divisibility rules to factor numbers. 0506.2.5 Estimation - Make reasonable estimates of fraction and decimal sums and differences. 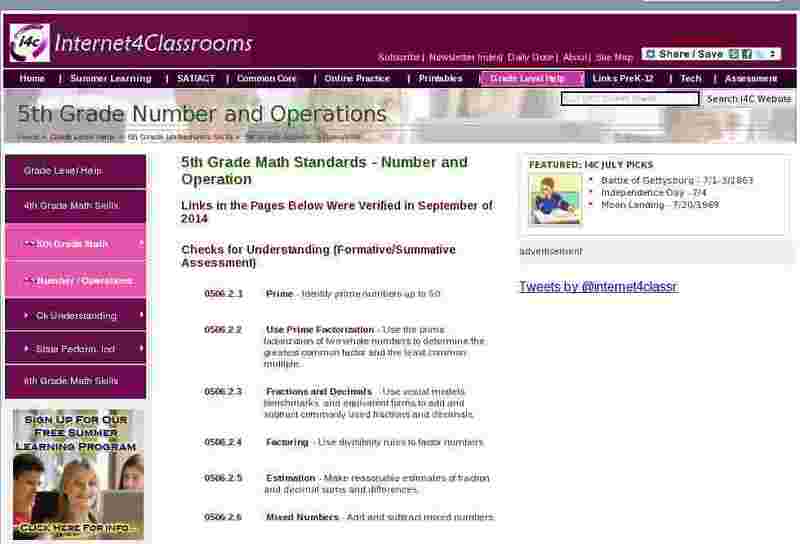 0506.2.6 Mixed Numbers - Add and subtract mixed numbers. 0506.2.7 Decimal Point - Understand the placement of the decimal point in calculations of multiplication and long division, including the placement in the estimation of the answer. 0506.2.8 Division by Zero - Understand that division by zero is undefined. 0506.2.9 Negative Numbers - Explore numbers less than 0 by extending the number line through familiar applications (e.g., temperatures below zero, owing money, measuring elevation below sea level). 0506.2.10 Exponential Notation - Use exponential notation to represent repeated multiplication of whole numbers. SPI 0506.2.1 Write Numbers - Read and write numbers from millions to millionths in various contexts. SPI 0506.2.2 Prime Factorization - Write the prime factorization of numbers through 50 using both exponential and standard notation. SPI 0506.2.3 Real World - Select a reasonable solution to a real-world division problem in which the remainder must be considered. SPI 0506.2.4 Division - Solve problems involving the division of two- and three-digit whole numbers by one- and two-digit whole numbers. SPI 0506.2.5 Decimals and Fractions - Solve addition and subtraction problems involving both fractions and decimals. SPI 0506.2.6 Proper and Improper - Add and subtract proper and improper fractions as well as mixed numbers. SPI 0506.2.7 Equivalent Representations - Recognize equivalent representations for the same number. SPI 0506.2.8 Terminating Decimals - Write terminating decimals in the form of fractions or mixed numbers. SPI 0506.2.9 Compare Numbers - Compare whole numbers, decimals and fractions using the symbols <, >, and =.